Abram John “Abe” Wiebe: missionary; born 8 November 1936 in Agassiz, British Columbia (BC), Canada, to John A. and Susanna (Kehler) Wiebe. He was the seventh child in a family of six sons and four daughters. Abe Wiebe married Joyce Morgan, a fellow missionary, on 11 April 1964 in Casablanca, Morocco. They had two daughters, Patricia Joy and Marie Annette. Abe died on 22 September 2007 in Brampton, Ontario. Abe spent most of his early years on the farm in Abbotsford, BC where he learned to work hard. Abe attended Mennonite Educational Institute (MEI) in Abbotsford for all of his secondary schooling. It was during his Grade 13 year in 1956 that he accepted Christ as his Saviour during a spiritual emphasis week with Canadian evangelist Henry Unrau. One week later Abe was baptized at Central Heights Mennonite Brethren Church in Abbotsford. Further education followed at Columbia Bible College in South Carolina, where Abe graduated with a Bachelor of Arts (BA) degree in Biblical Education. His heart was set on ministry to the Muslims of North Africa. Wiebe sailed for Morocco on 26 April 1962. His first two years in Casablanca, Morocco were spent in language training, both French and Arabic. This was followed by four years of ministry in Morocco, during which time he was married to Joyce. They were assigned to Algeria from 1969 to 1974. Here Abe became the Algerian Regional Superintendent for NAM. While on furlough, he was ordained as a minister at Central Heights Mennonite Brethren Church in 1974. The Wiebes’ next assignment was to headquarters in Aix-en Provence, France, where Abe served as the General Director of NAM. He held that position for four terms (1975-1991). It was during his tenure that NAM became Arab World Ministries (AWM) and expanded its mandate from Mauritania across North Africa to the Middle East and the Gulf. 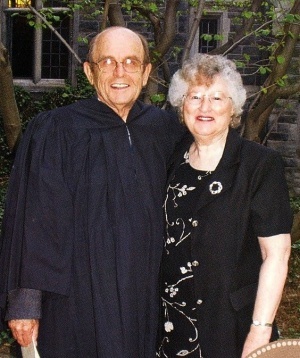 From May 1993 to February 1999, the Wiebes spent time as field missionaries in Paris, France, at which time they returned to Canada where Abe worked as coordinator of Canada Ministries until their retirement in December 2002. Wiebe continued to further his education. He obtained a Master’s degree in Middle Eastern Studies at the University of Toronto from 1991 to 1993. His second Master’s degree in Theology was obtained in 2005 from Trinity College, University of Toronto. In 2006, Abe published his memoirs. The book is called How Wide is my Valley. Abe and Joyce Wiebe’s life’s work, which spanned 40 years for Abe and close to 50 years for Joyce, was sharing the gospel of Jesus Christ with Arab Muslims. Wiebe, Abe. How Wide is my Valley. 2006. Wiebe, Joyce. Interview by author. (26 May 2010). Personal papers and family documents located in the archives of Columbia International University, South Carolina. Klassen, Eleanore. "Wiebe, Abram John "Abe" (1936-2007)." Global Anabaptist Mennonite Encyclopedia Online. August 2010. Web. 21 Apr 2019. http://gameo.org/index.php?title=Wiebe,_Abram_John_%22Abe%22_(1936-2007)&oldid=96829. Klassen, Eleanore. (August 2010). Wiebe, Abram John "Abe" (1936-2007). Global Anabaptist Mennonite Encyclopedia Online. Retrieved 21 April 2019, from http://gameo.org/index.php?title=Wiebe,_Abram_John_%22Abe%22_(1936-2007)&oldid=96829.